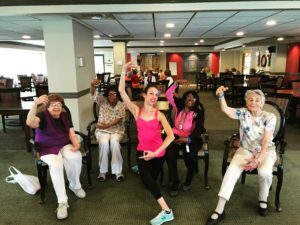 With an aging population seeking more options when it comes to fitness, studies show that dance exercise might be the solution to getting more older adults to stay active. Vitality Ballet classes are engaging and effective ways to merge the benefits of art and exercise into a full-body workout. Expert instructors lead each class from professional ballet dancers to certified yoga instructors. Our teachers lead the class through combinations of modified steps, stretches, sequences and combinations all perfectly timed to music. Vitality Ballet is most unique in that the class can be taken entirely from a chair. This allows participants in wheelchairs, those with unstable balance, Parkinson’s or anyone differently abled to enjoy the benefits of dance from the safety of their chair. Adults who are fully ambulatory also enjoy this program as a unique exercise challenge for balance, shifting of weight and posture. 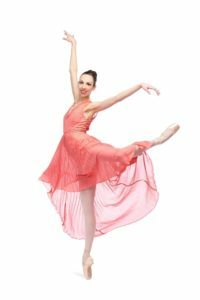 Vitality Ballet programming offers a fun and innovative way to stimulate the mind and invigorate the body. Our philosophy is simple: Improve quality of life through lifelong movement by invigorating the body, mind and spirit through “artistic exercise”. Vanessa is the founder of Vitality Ballet and a former professional dancer with 24 years of classical training. Originally from New Jersey, Vanessa’s training includes the Conservatory of Dance at SUNY Purchase, Princeton Ballet, Miami City Ballet School and STEPS on Broadway in New York City. She has performed with ballet companies all over the country. Vanessa danced with the Saint Louis Ballet performing soloist and principal roles for eight years. Vanessa was also on faculty with the Saint Louis Ballet School, and has taught at numerous ballet schools across the country. Vanessa started Vitality Ballet in 2012 with the encouragement of her mom (a fan of ballet herself). Starting with just a handful of participating facilities, today the program reaches over 60 senior living facilities across St. Louis City and County. 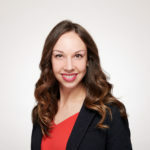 Vanessa is an alumna of Washington University in St. Louis with a degree in Marketing. Or Click Here to contact us through this site.